Shaving. Whether it’s a full-grown man beard or just a fuzzy mustache, it just has to be done. But the last thing you want is to end up with an itchy skin and sore razor burns. Luckily for you, we have gone all the way to prepare a complete actionable shaving guide, highlighting all the essentials from proper wet shaving to post-shaving skin care, to turn your beard trimming into a pleasant morning ritual. Men, compared to women, have a thicker skin and oilier face. This calls for adequate skin prepping before getting down with the shaving. First, wash your face with soap and warm water to clear off excess oil on the skin, open the pores and soften the whiskers. A better alternative to this would be taking a steam bath prior to shaving. The Grooming Essential describes a quality shaving cream as rich, creamy, and non-foamy. Investing in a quality shaving cream will go a long way to reducing skin irritation and razor burns when shaving off your facial hair. According to Men-U, the best shaving creams are rich in lubricants and moisturizers, to offer less resistance to shaving blades and minimize cuts during shaving. 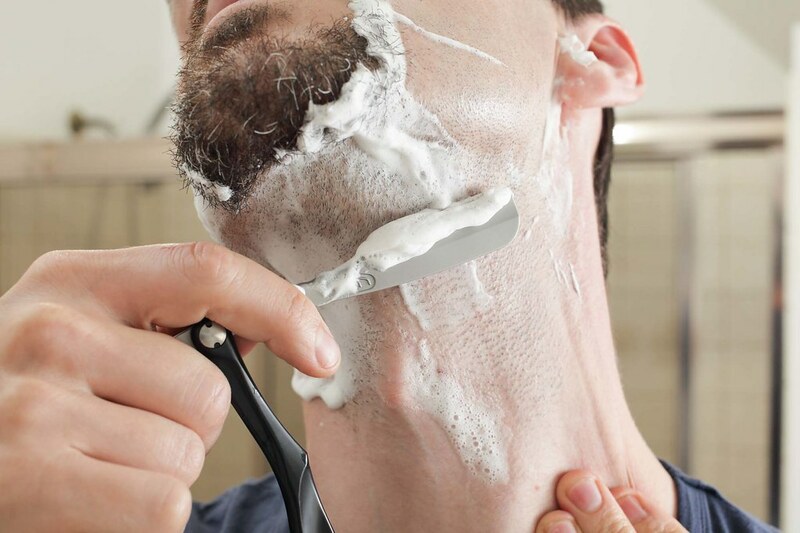 Shaving creams are primarily meant to lubricate your skin for smooth blade gliding over your skin while keeping your facial hair erect and soft for the cut. Using a shaving brush, apply a thick layer of the shaving cream and allow it lock the moisture on your beard for about three minutes. A good shaving brush helps set the hair upright for a clean cut, lather the shaving cream, and exfoliate the dead skin. Now slowly slide your shaving blade in the direction of hair growth to trim the beard. After shaving, your skin is left exposed and vulnerable. While it’s still soft, wash off the remaining shaving cream with warm water and soothe the shaved area with natural oil. This helps prevent spotting and the surfacing of a rough rash after shaving. Immediately rinse with cold water and pat with a dry soft towel (Do not rub the shaved area with the towel. Just pat to soak the water). Your shaving regimen is incomplete without soothing the shaved area with a moisturizing aftershave cream or balm. A good aftershave lotion should absorb into the skin easily and have a dry matte finish. Again, some creams and lotions contain mild alcohols which could cause irritation on sensitive skin. The ideal aftershave moisturizes and soothes the skin without causing any prickling side effects, leaving you with a clean, refreshed skin. According to The Men-U Academy Barber Handbook, shaving should be done in the direction of beard growth. Not to say that shaving in the opposite direction is wrong, but there are some unpleasant setbacks especially for men who are still learning how to shave. You are more likely to graze your skin and cut yourself when shaving against the direction of your beard growth. It’s easier to trim your beard well below skin level when shaving against the direction of beard growth, which could lead to the development of razor bumps on your skin. 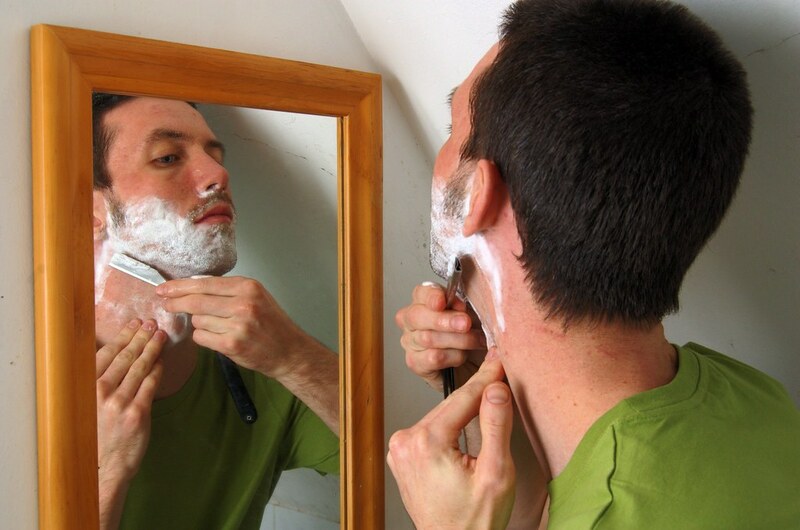 When shaving, start with the side beard and the areas surrounding the jaw. Finish off with the chin hair since the tissues around this area are tough and could blunt your razor too early. Speaking of blunt razors, always use a clean, sharp blade when shaving your beard. Sharp shaving blades require less pressure when trimming your beard and considerably reduce the risk of blade cuts. Housekeeping? Yes, please. After shaving, you want to do some maintenance cleaning on your shaving razor too. Thoroughly rinse the blade with running tap water to wash off the shaving cream, tiny hairs, and skin muck. Shake the blade and safely store it in your cabinet. Avoid wiping the wet blade with a towel or toilet paper – this only dulls it faster.